Science has proven that green leafy vegetables and fruit knock all others off the top spot for their spectacular concentration of phytonutrients, vitamins and fibre. And the quickest way to get an instant boost of these healthy greens is in a juice or smoothie. Packed with raw, whole vegetables and fruit, as well as herbs, spices and healthy fats, the fabulous recipes in Clean & Green are literally a health boost in a glass--or a bowl of soup. If you juice regularly, you'll be getting all the essential vitamins, antioxidants and minerals that you need. 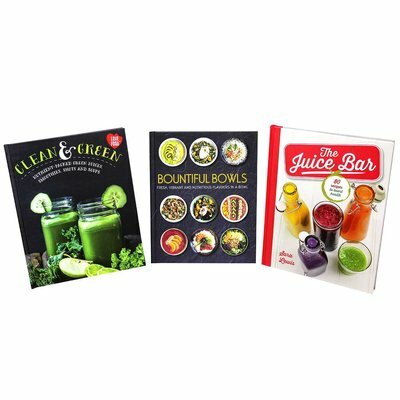 Each chapter covers the main health benefits of juicing: Cleanse your body with a Grapefruit Crush or the Parsley Purifier; get a healthy glow from a Fennel Flush or a Kiwi Quencher; detox with a Grape & Lychee Reviver, a Green Tea Punch or a Mint Rejuvenator; and soothe your digestive system by drinking a Pineapple Pump, a Broccoli Booster or a Spinach Aid. Power bowls are the latest big thing in the foodie world - we now see smoothie bowls, breakfast bowls, Buddha bowls, macro bowls, poke bowls, quinoa bowls and flex bowls on upmarket menus and health blogs alike. So, what is the appeal? A substantial part is linked to macrobiotics, the idea that fresh, unprocessed local produce is always the tastiest and healthiest and that a varied combination of food groups will give you the perfect balance of nutrients. The 50 bowls in Bountiful Bowls focus on breakfast bowls, savoury snacks and lunch bowls, salad bowls, main meals in a bowl and dessert bowls, each one with a clear emphasis on fruit, vegetables, beans or alternative sources of protein. The bowls are often colourful and visually appealing, based on bright natural colours and appetizing textures - crisp red peppers, deep red tomatoes, crunchy pale green salad leaves, blanched red-rimmed circles of radish, the lush purple of beetroot, small blocks of feta or the inviting oranges, yellows and greens of split peas or lentils. So it's time to embrace the bowl in all its glory, with dishes such as Beetroot and Pomegranate Smoothie Bowl, Crunchy Noodle Bean feast, Grilled Chicken and Slaw Bowl, Veggie Burger Bowl and Pumpkin Pie Smoothie Bowl. Give your body the boost it needs with a mouth-watering drink from The Juice Bar. For breakfast, power-up on slow-release energy, with drinks such as Muesli Motivator or Berry Kick-start. When you're thirsty, rehydrate with a cool, ice-packed Raspberry and Watermelon Crush or Minted Melon Squash. Those who are looking to improve their diet, health and well-being with the help of fresh, exciting and invigorating juices.